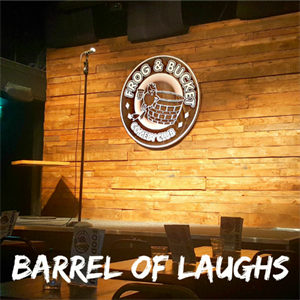 Our Barrel of Laughs show takes place every Friday and Saturday night. Bringing you 3 top-flight national and international acts plus one of the Frog's fantastic comperes. Our cabaret style club gives you the best possible atmosphere for comedy and is the perfect choice for your night out whether a couple or a party group, with reserved tables & delicious food. Our doors will open at 6.45pm, so you will have plenty of time to have a drink before the show starts at around 8pm. The show will end at approximately 10.30pm.